Dariusz Michalczewski was a staple of German TV for much of the 1990s and early 2000s, making a light heavyweight division record 23 defenses of his WBO title. His reign lasted a staggering 9 years and one month, just one month shy of Archie Moore’s 175-pound record. Michalczewski was born in Gdansk, Poland in May 1968, during a communist regime and was the eldest of three siblings. As a youngster Michalczewski had a tough time, his father was ill with cancer and passed away when he was just 12 years old. He was a rambunctious child so, as the family enjoyed boxing, his uncle took him to the gym to burn off some of his exuberance. Boxing taught him discipline and kept him away from the streets. From a young age, Michalczewski made good money as an amateur boxer and by the time he was in his mid-teens, had more than he knew what to do with. So, with the communist regime falling apart, he defected to Germany in 1988. “I felt Germany would welcome me with open arms,” Michalczewski told RingTV.com through his son Michael. “I was Polish champion, on the national team. I felt I would be accepted quickly but that wasn’t the case. He won the German national title in 1990 and the European crown the following year, but failed to qualify for the Olympic or World Championship squads. Torsten May, a future world title challenger, won gold at both tournaments. Michalczewski exited the unpaid ranks with a record of 133-15-2 and turned professional under the auspices of German powerhouse Universum in September 1991. The Polish-born fighter progressed quickly, winning his first 23 bouts, with 19 of those coming by knockout. In September 1994, Michalczewski beat Leeonzer Barber for the WBO light heavyweight title and one of the longest reigns in boxing history began. In fact, only Joe Louis made more successful defenses – 25 – and only six men held titles for a longer period of time in any weight class. Initially, Michalczewski stepped up to cruiserweight to win the WBO belt from Nestor Hipolito Giovannini before dropping back down to a more natural 175-pounds. Michalczewski (right) at war with Virgil Hill. After eight defenses, Michalczewski met Virgil Hill in a unification bout. Hill was riding high on the back of adding the IBF title to his WBA strap, in his most recent fight, by besting Henry Maske. Michalczewski outpointed his rival to hold three of the four sanctioning body titles. Such was Michalczewski’s status in Europe that a record boss introduced him to Mark Wahlberg. The two became good friends and the Hollywood actor attended several of Michalczewski’s fights. At that time Wahlberg was a singer, known as Marky Mark. He even sang a track called “No Mercy” and dedicated it to his friend. The video chronicled the early years of Michalczewski’s life. 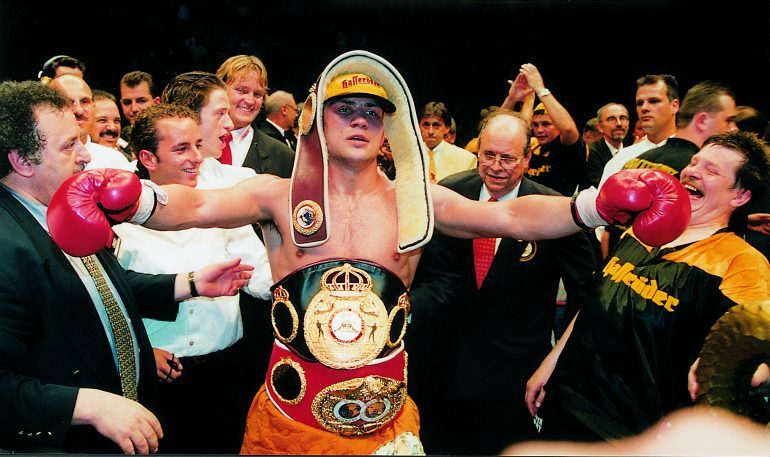 Michalczewski continued to make successful title defenses and, in September 1998, met the unbeaten Mark Prince. The fighter known as “Tiger” stopped the big-punching Brit in the eighth round and has fond memories of that victory. “I felt my best win was against Mark Prince,” he said. “It was the first time I was in complete control; I was very self-confident. I ate him up (laughs). Michalczewski reigned supreme, beating all before him. Although there was always talk of a fight against rival light heavyweight champion Roy Jones Jr., the matchup never came to fruition. Michalczewski stayed in Germany and Jones stayed in America. The hard-punching pressure-fighter continued his road show around his adopted homeland, beating up on the likes of Drake Thadzi (TKO 9), Montell Griffin (TKO 4) and Graciano Rocchigiani (TKO 10) in a rematch. He also gave Richard Hall a rematch, having beaten him in 2001, and things started badly for Michalczewski. Michalczewski with Richard Hall following their rematch. The hard fights finally caught up with him when he surprisingly lost his WBO belt to the now-deceased Julio Gonzalez in October 2003. Michalczewski felt he deserved the win and after 16 months returned to face Fabrice Tiozzo – who he beat as a junior in the European championships in 1986 – for the WBA strap. He was a shell of his former self and was stopped in the sixth round. He officially retired in June 2005, exiting with a 48-2 (38 knockouts) record. He took part in 27 world title bouts and only seven men have taken part in more. 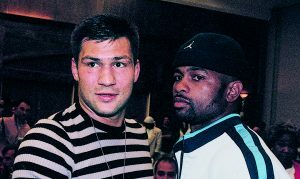 When asked who he’d most liked to have fought, Michalczewski did not hesitate, “Roy Jones Jr.,” said the former two-weight world champion instantly. “There were serious negotiations, but we could never get the deal done because one side wanted Jones to come to Europe and the other wanted me to go to the United States. I guess a big part of it was television. Michalczewski with the great Roy Jones Jr. when both men were at their peak. Michalczewski also said that he was interested in fighting Maske, however, they fought for rival promoters, on different TV channels, and couldn’t broker a deal. Now 48, Michalczewski lives in Gdansk. He has been married to Barbara – his fourth wife – since 2009 and has four children. He is a successful businessman with interests in “Tiger” energy drink, a chain of fitness gyms, real estate and he is branching out into an internet over satellite enterprise called Tiger Speed. One of Michalczewski’s passions is his Charity Foundation: “Równe Szanse” or “Equal Opportunities”. Michalczewski kindly spoke to RingTV.com about the best he faced in 10 key categories. Virgil Hill: For me it is straight forward. His jab was very precise and it was very hard. Hill: Leeonzer Barber and Virgil Hill. Barber was physically very strong (with) long arms and had good feeling for distance and timing. Virgil Hill was quite fluid; it was hard to get him in the right spot. I would give hands down to Virgil Hill. He was a more complete package and smarter. Hill: I think Virgil Hill took the most hits from me. I didn’t knock him out but he really took a lot in that fight. 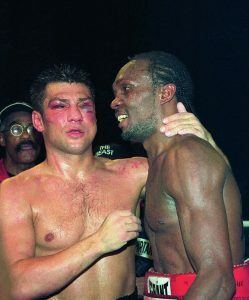 He was one of the most world class boxers I fought. Up to that day, when we fought, he had only lost to Thomas Hearns. Montell Griffin: He was probably the fastest. One of the things about Griffin was he fought at different heights. He was able to move his body up and down and threw punches from different positions. Michalczewski engages in non-physical chess with Hill. Hill: Again, Virgil Hill which, I guess, comes down to defense. Nestor Giovannini: It’ll come back to the main guys like Barber and Hill but I thought Giovannini was, in a sense, the smartest guy. He was a little bit dirty (and) made the fight uncomfortable. In reasonable terms, (within) the boundaries of the sport, but he was, in a sense, dirty. He was street smart. Graciano Rocchigiani: I never allowed somebody to push back. One of the toughest guys to push around was Rocchigiani, especially in the second fight. That fight happened mainly in the middle of the ring, so I couldn’t move him around. He also attacked. I out powered him with punches to the stomach. Richard Hall: Mark Prince, threw all his punches as hard as he could. Richard Hall was very dynamic and precise from distance. Hill: Montell Griffin and Virgil Hill. Ultimately, it comes down to I fought Virgil Hill for 12 rounds and I knocked out Montell Griffin early (Round 4). Plus, it was a fight for three titles. 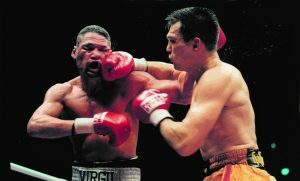 I went toe-to-toe with Virgil Hill at the highest level. Hill: It is between Barber and Hill. Hill had good footwork. He was a mature fighter, so he was smart (and) was able to provoke and control. I think Virgil had a really good feeling for distance. It was a chess match. 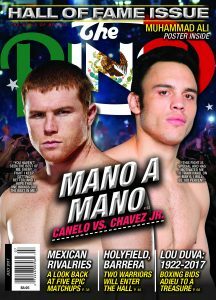 THE RING would like to thank Michael Michalczewski for translating this feature.